In April 2015, the British government substantially overhauled the system for Secure English Language Tests (SELT) in the UK. As a result, IELTS became the only approved test provider for students applying from outside of the UK. A second provider, Trinity College, was also approved, but only for testing offered for students already in Britain. SELT results are required by UK Visas and Immigration (UKVI) as proof of a visa applicant’s English language proficiency. And so the significance of last year’s changes, aside from narrowing the field of approved testing agencies, is that they greatly reduced the number of testing centres available to prospective students. Previously, there had been more than 1,000 eligible testing centres globally. The new rules have reduced that number to roughly 275 permanent and “pop-up” centres outside of the UK as of June 2016, including only four in all of Brazil and 15 in China. The pop-up centres provide occasional testing, either once per quarter or once every six months depending on the location. Also this year, IELTS has introduced a new computer-based testing service for students in a limited number of locations in the UK, China, Hong Kong, India, Malaysia and Japan (with more to be added over 2016/17). This new option allows for the completion of Listening, Reading, and Writing test components online. The Speaking component of the exam, however, will continue to be delivered face-to-face at an approved test centre. There have been reports over the past year that limited test availability has been frustrating the recruitment efforts of agents and institutions alike, and both the new pop-up centres and online testing are clearly aimed at restoring or expanding testing services in areas that have not been well served by permanent test centres. When is a SELT required? Students studying at degree level at a British university – that is, at a university included on the Tier 4 Register of Sponsors – do not need a SELT. Rather, they will have to meet the English proficiency requirements of the institution for which they are applying. The language requirements of universities may vary by institution and by programme (for example, medical and law courses may have higher requirements than other areas of study) and students are strongly advised to check requirements carefully for each institution to which they apply. Leaving the recent Brexit vote aside for the moment, the April 2015 overhaul brought no changes for prospective students from European Union/European Economic Area member nations, as well as those from Switzerland. They require no visa to study, live, or work in the UK, nor, by extension, do they require a SELT. They must, however, meet the English language requirements of the institution to which they are applying. Applicants from outside the EU, EEA, and Switzerland who wish to enroll below degree level (i.e., to study with a language or further education provider, or in a non-degree programme at a university) need a visa to study in the UK, and so must also pass a SELT. 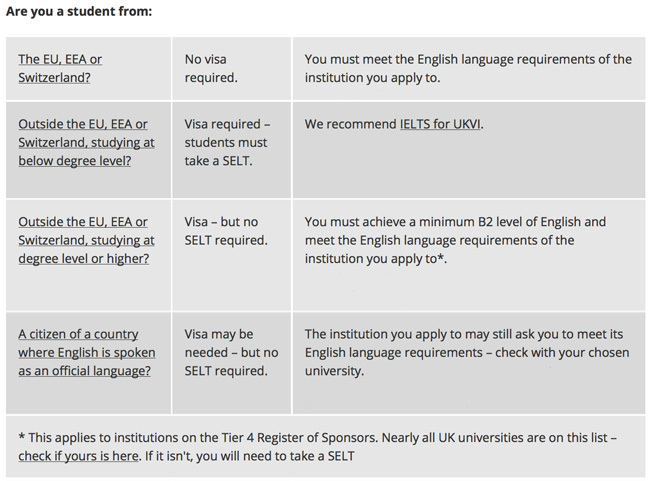 Applicants from outside the EU, EEA, and Switzerland who wish to study at a higher education institution at degree level or above also need a visa, but not a SELT. However, as noted above, these applicants must also meet the English language requirements of the institutions and programmes to which they apply. Likewise, no SELT is required of citizens of countries where English is spoken as an official language. These include Antigua and Barbuda, Australia, Bahamas, Barbados, Belize, Canada, Dominica, Grenada, Guyana, Jamaica, New Zealand, St Kitts and Nevis, St Lucia, St Vincent and the Grenadines, Trinidad and Tobago, and the United States. Depending on the country of origin and length of study, however, a visa may be required. These provisions are summarised in the following adapted table originally prepared by Cambridge English. For additional background, please see a detailed FAQ summary from Cambridge English. This entry was posted in Europe, Higher Education, Language Learning, Regions, United Kingdom and tagged language learning, study in the UK, student visas, Tier 4 UK visa, Teaching English as a Foreign Language.